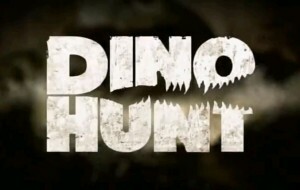 You can now watch Episode 3 of DinoHunt Canada on YouTube. The four part series originally aired on History Channel in January of 2015. Episode 3 “The Dawn of the Dinosaurs” focuses on the dinosaur bones and footprints found on the shores of Nova Scotia’s Bay of Fundy. 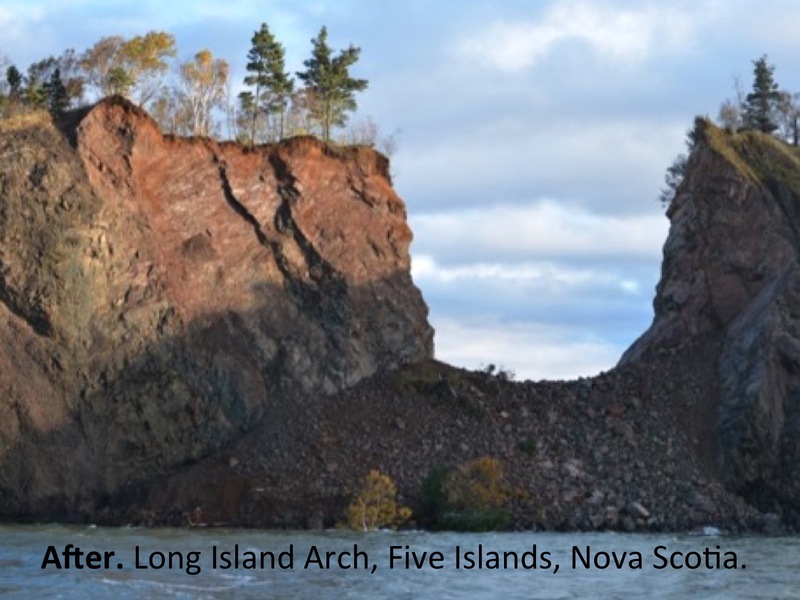 Watch the episode to see how the team from the Fundy Geological Museum work to expose the bones of 200 million year old dinosaurs, while others search for clues among the dinosaur footprints and other fossils found along the shores of the Bay of Fundy. On Thursday October 29th the remnants of Hurricane Patricia rolled through the Maritimes. The storm coincided with a particularly high tide (14.1 meters) that was forecast to occur in Parrsboro, Nova Scotia. 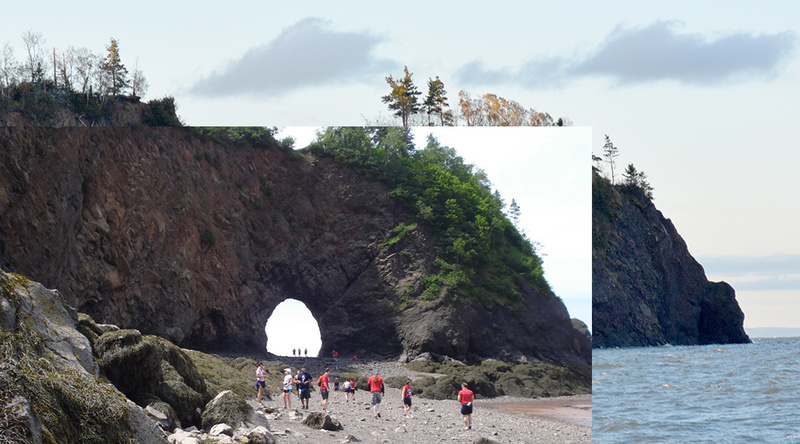 The storm surge resulting from the post-hurricane storm caused damage along the Parrsboro Shore of the Bay of Fundy. Spencer’s Island saw large gravel movement and coastal flooding. 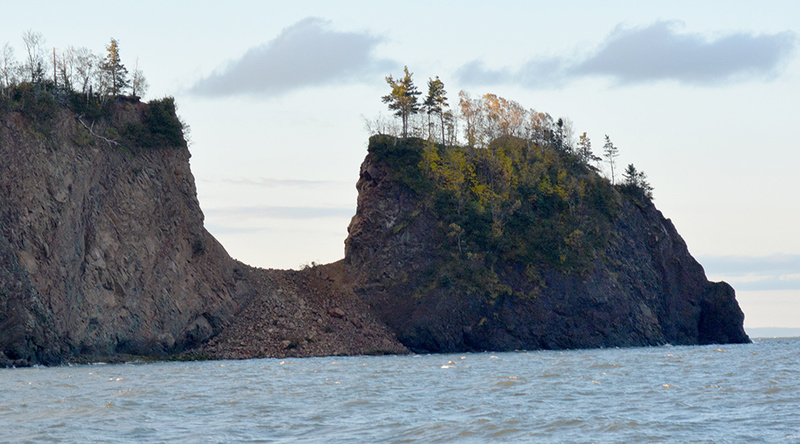 Waves in the Minas Basin (Bay of Fundy) were also large and pounded against the cliffs at Two Islands. This storm battered the sandstone cliffs at Wasson Bluff, where the dinosaur research site is located. The Museum received information from D. Nardini, a private mineral collector who had visited the shore after the storm. The cliffs were washed clean and there appeared to be some recent erosion from the storm surge. 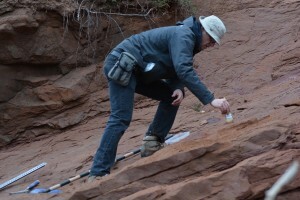 Dr. Tim Fedak, a palaeontologist and the curator at the Fundy Geological Museum went to examine the cliffs after the storm surge. NOTE: The site at Wasson Bluff is protected by Special Places Protection Act. 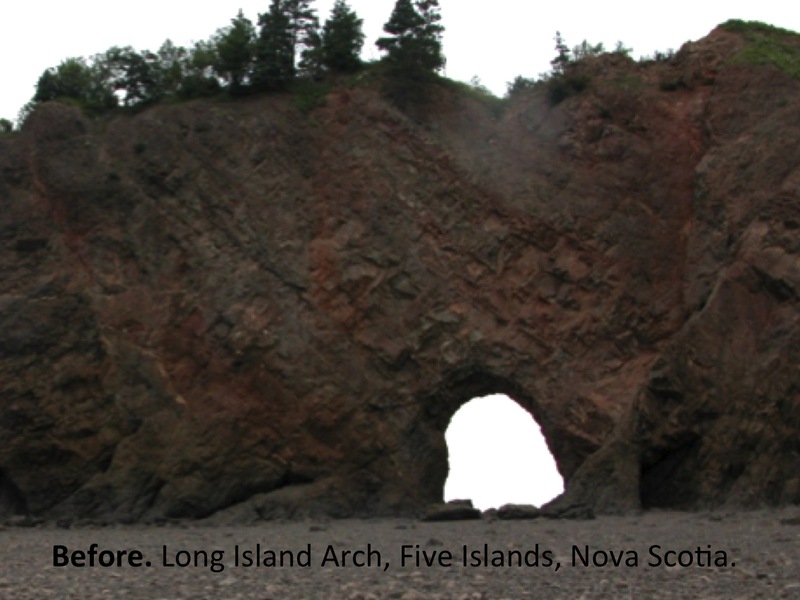 No one is to carry out any work around the cliffs, with all fossil collection prohibited, except with an approved Nova Scotia Heritage Research Permit. Fedak visited the research site in the morning of Halloween Day 2015. The initial task at the Research Site there was to capture several high-resolution photographs of the cliff to be used to create 3D scans of the cliff surface. More on this in the future. After completing the photographs for 3D scanning, Fedak examined the site of the “Princeton Quarry” where a mass accumulation of dinosaur skeletons has been recovered during previous research. 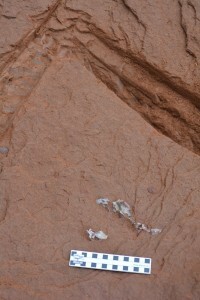 The sandstone cliff at the research site was washed clean of all debris – and new dinosaur bone was visible on the surface of the cliff. A new discovery! 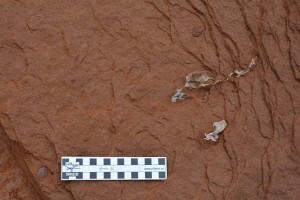 This is what the new Fundy dinosaur bones looked like when found on Halloween Day. A channel was cut above the dinosaur bones to prevent rain from washing over the specimens. 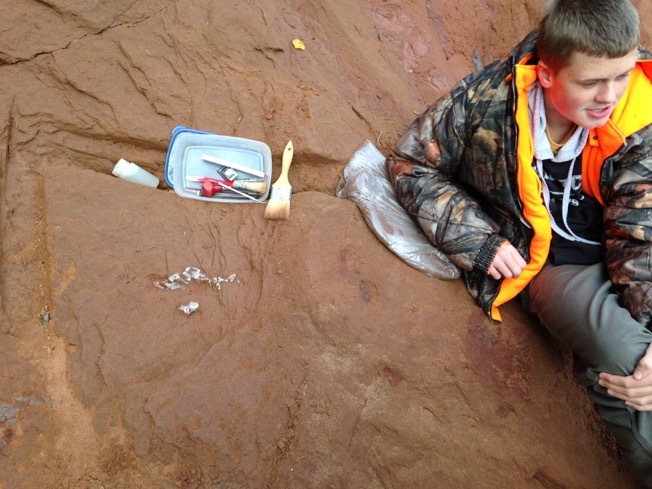 The sandstone cliff at the research site was washed clean of all debris – and new dinosaur bone was visible on the surface of the cliff. A new discovery! The weather forecast was calling for rain, so to prevent further erosion of the specimen a channel was cut in the sandstone. The channel around the specimen would direct rain flowing down the cliff around the specimen. 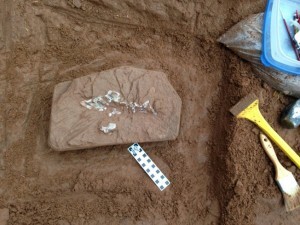 Over the next several days the edges of the Fundy dinosaur bones were carefully exposed. During one of these trips, a high school student (Timo Sanders) and his father (Frans) assisted with some of the early excavation work. An excellent opportunity for Timo to learn first hand how palaeontologists work to collect new fossil specimens. After several trips to the research site, the channel around the specimen was carefully expanded to allow a small block to be removed. Watch a video showing some of the work done to create the channel around the dinosaur bones. 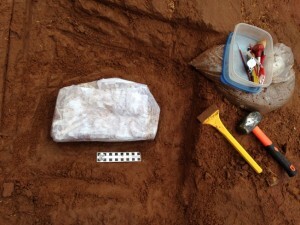 The fossil bones and sandstone block were then covered with a plaster and burlap field jacket (like a cast for a broken arm), which protected the bone and sandstone block. A large and wide chisel was used to separate the block of sandstone containing the 200 million year old dinosaur bones. The block with dinosaur bones is now ready to be removed. 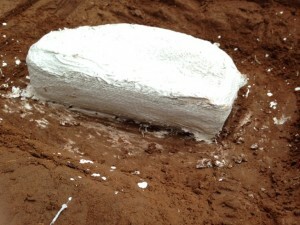 Paper towel is placed over the dinosaur bones and rock, a protective cushion. Plaster is mixed and strips of burlap dipped in plaster are wrapped around the block to make a hard and protective field jacket. 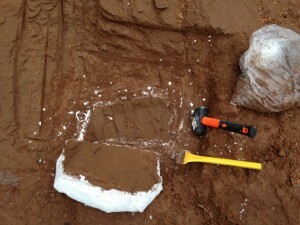 The plaster and burlap field jacket dries for thirty minutes and is now hard, protection for the rock and bone. Side view showing the jacket surrounds all edges of the sandstone block. 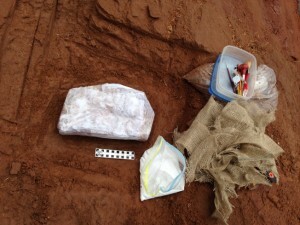 A hammer and chisel are used to free the sandstone block and dinosaur bones from the cliff. 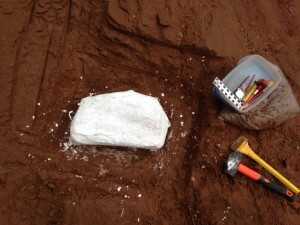 The block was then removed and taken to the Fundy Geological Museum. The new dinosaur bones will be studied in the Fossil Research Lab. Visitors to the Museum will be able look into the Fossil Research Lab and see the block being worked on by museum staff and volunteers. 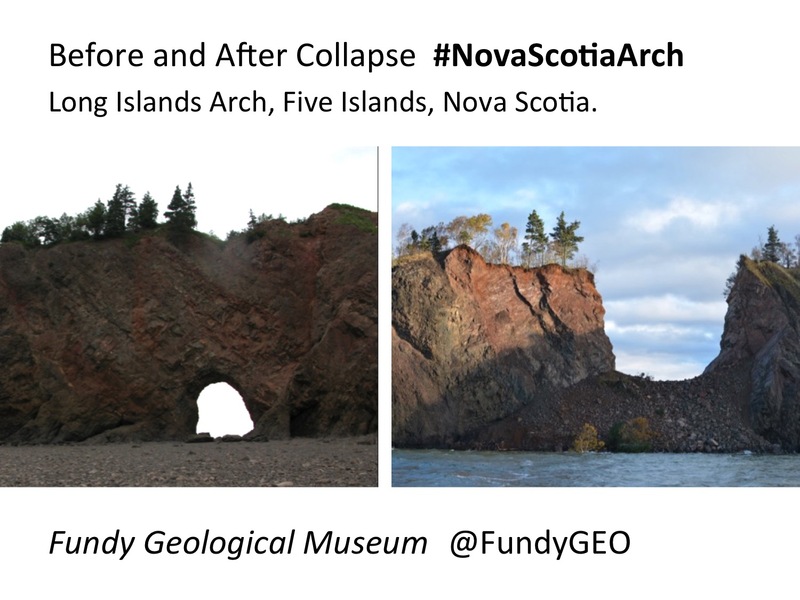 Visit the Fundy Geological Museum next spring/summer to see the latest updates on this new discovery.